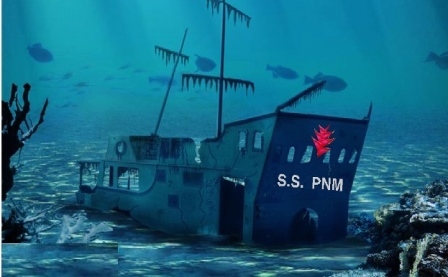 United National Congress » Captain Rowley’s PNM Titanic? For anyone who held to the dream of the PNM being ready and able to form the next government, last Sunday’s internal elections would have been the pin that burst that bubble. In the first place we now know the Captain Rowley is the third most popular candidate in the party he leads. He obtained 18,121 votes while two others, Faris Al-Rawi and Anthony Garcia, obtained more. Mr Al-Rawi received 18,228 votes or 107 more than his captain, while Mr Garcia got 18,167 or 46 more. The first message is that Captain Rowley does not command the greatest support within his party, perhaps because of his temperament, his combative style, or lack of a compelling message. The second important lesson is the fact that despite the intense campaigning the voter turnout was exceedingly low. For a party that boasts of 81,000 members to obtain less than 18 per cent support means that the party of Eric Williams, under Captain Rowley’s watch, has not been able to excite more than the ever-declining older demographic. The third lesson is the fact that for a party that has been such a major part of the political landscape of our country, the internal elections revealed the intellectual vacuity, the paucity of new ideas, and the bankruptcy of vision. This is the party that desires to take our country into First World status by Patrick Manning’s reckoning by 2020 and by Captain Rowley’s, by 2030. One commentator called it a campaign of the walking dead. It was pure standpipe politics. Who was not liked because he was too black? Who was too soft to be a leader? Who was disloyal to the PNM and should be expelled? Who used party money for his personal campaigning? Who in the UNC thief? What dress and shoes Kamla “does wear”? Who hide voting lists from whom and when will the list become available? And who is the baddest, most macho, Rottweiler in town and therefore most fit to lead this PNM country? Eric Williams must be turning in his grave. He gave us “perspectives for a new society” which sought to chart, post-1970 Black Power Revolution, a new economic path for the country based on our citizens reclaiming through State enterprises the commanding heights of our economy. It was Eric who used George Goddard, Prince Cumberbatch and others at the Carnival Development Committee to establish Pan Trinbago and refocus inner city gang warfare into Panorama warfare. That was intellectualism, compared to the standpipe bacchanal as reflected in the internal PNM elections. Another commentator derided our government-in-waiting’s refusal or inability to articulate an alternative vision that is superior to that of the UNC, and which differentiates it from the UNC. We have not heard any articulation by Captain Rowley of a PNM policy on crime reduction, on improvements in the health sector, on his plan to create well paying jobs for the young who are graduating from the tertiary education institutions, on his approach to reviving the fortunes of the energy sector, or his strategy for reducing the backlog of cases before the courts. It is a sad day indeed when a party aspires to form the government and refuses to articulate a vision for taking the country forward. No one is buying the argument that the PNM is not articulating its vision for fear that the People’s Partnership would steal it. That’s a cop out. So what if the Partnership Government uses a PNM idea and implements it to improve the well-being of the citizenry? If that is PNM thinking, it is proof that the PNM is more interested in winning an election than in our welfare.